Laura is a small business owner and ceramist based in Sydney. Despite her business being less than one year old, she has created a unique brand of handcrafted ceramics that grace tables right across the country. Leaving behind the traditional 9-5, Laura found a way to pursue her dreams of a creative career path by launching her small business, Mennt. We sat down with Laura to find out a little more about her journey and how being a small business owner has changed her life. I grew up on a fairly remote farm in Western Australia, so I didn’t experience the diversity in careers available in the city. After high school, I studied primary education – my mum was a teacher so it felt familiar. Shortly after completing my degree, I moved to Sydney and realised I needed a more creative career path. This coincided with rediscovering ceramics and I found myself sinking all my spare time and money into porcelain. How did Mennt get started? Growing up, I learnt the ‘make or make do’ approach. This empowered me to make things for myself that I felt the market was lacking. Mennt was created as I couldn’t afford what was currently available, and I couldn’t find anything simple enough or with the details that I preferred. After two years of development and learning, Mennt was launched with the essentials; plate, cups and bowls. Functionality is paramount to my designs. I wanted to create ceramics that wouldn’t sit a cupboard awaiting a special occasion, but could be used daily. It seems like a small thing, but creating products that were dishwasher-safe was critical to our success. What was one of the biggest hurdles you faced as a new business owner? An ongoing hurdle for me is maintaining confidence in myself and what I am doing. When you’re setting out to achieve something you have never seen modelled before, it’s really easy to lose track and feel lost. This, at times, has seen me struggle to take necessary financial risks required for the future growth of the business. Overcoming this has been a continuous process of reminding myself of my business values, engaging with other creatives, and accepting that imposter syndrome is a real thing that all creatives face. The flexibility is incredible. Even having that option to spend the morning at the beach or just work in a cafe is something I wouldn’t trade for anything. However, this flexibility is a double-edged sword. I’m entirely responsible for own time, which can mean late nights, missing events and sometimes spending my days in a lonely environment. The biggest thing that keeps me going is my vision for Mennt. I know the future of the company will surround me with talented people where I can constantly learn and be pushed out of my comfort zone. Simplicity and quality materials. 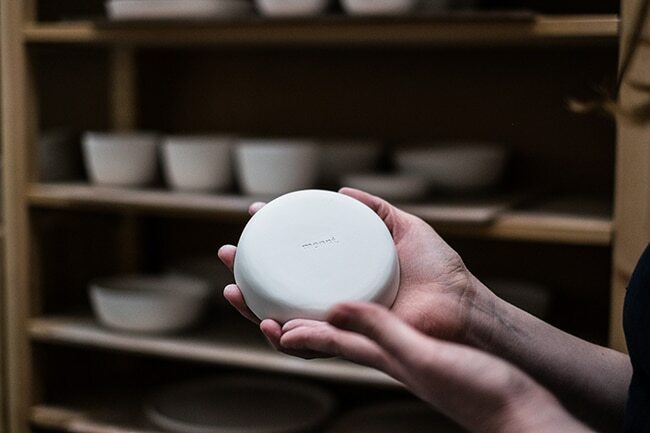 I choose to focusing on designing simple ceramics that allow the food to be the hero. I also believe that simplicity doesn’t date and I focus on using high-quality materials that, with care, will last for many years. You use QuickBooks to manage your finances. Why? I found out early on that there’s a lot more to running a business than just creating a product and selling it. Nobody really tells you the importance of cash flow, or how difficult it can be to lodge your BAS for the first time. Math was never my strong suit, but QuickBooks can easily give me an overview on how my business is going. The mobile app is fantastic. I don’t really use my laptop too much outside of the studio, so having the mobile app with me at all times means I can take photos of receipts or check my financials quickly when I have gaps during the day. Why did you choose a digital software solution? It saves me time. While managing my finances is a big part of my business, it’s not the part I’m most interested in. Having a digital software solution helps to make the financial side of my business as streamlined and automatic as possible. Having only launched my business in April, I’m still finding my feet. However, I think it’s important to create some values for your business that really outline who you are and what you do. Having these values written down gives you something to look back on, and remind you why you do what you do.